If you love to DIY, chances are…you love to save money. For the next several weeks, I will be sharing with you ways to update things without replacing or spending a fortune. Today we are talking kitchen cabinets! Do you hate yours? Instead of ripping out the old and buying new ones, why not update the ones you have? Whether you add trim to the doors or paint your cabinets, you can get a great look without spending a lot of money. If your cabinets don’t go all the way to ceiling, a great way to update the look is to close off the area above the cabinets. This can be done using pieces of wood that are painted to match your cabinets. You can get as decorative as you want by adding trim. If you want space you can use, you can also buy thin cabinets that will fit in the area and paint all the cabinetry to match. A very simple and quick update is to add molding or trim to the cabinet doors. You can attach using short nails, but for doors that are thin, you want to use a strong adhesive. Liquid Nail is a great product because it’s strong and will last. If you won’t be painting over the doors completely, remember to stain or paint the trim to match before attaching it to the cabinets. There are many benefits to using chalk paint over latex or another type of paint on your kitchen cabinets. First of all, in many instances you simply need to clean the surfaces and apply one coat. You will need to add a sealant over the paint and while wax is often used it is not a good fit for kitchens as it is hard to clean. Chalk paint is not only easier to use, but also gives your cabinets a great look. Beadboard is another great way to update the doors of your cabinets. If you’re applying trim, you can put beadboard inside the trimmed out area for a great look. Beadboard can be purchased rather inexpensively and is easy to cut. 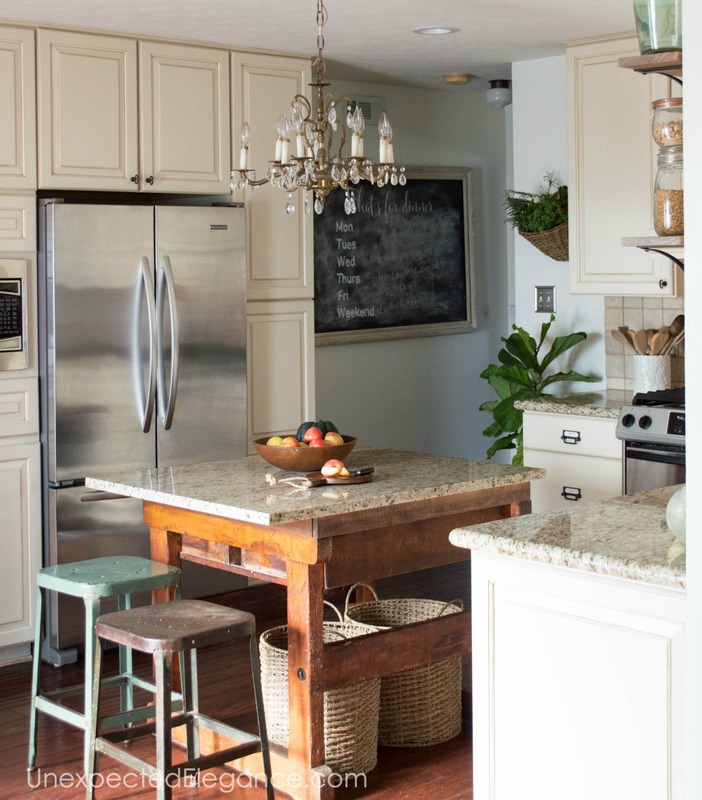 You can also put beadboard around your kitchen island to add visual appeal. If your cabinets don’t have any hardware this can be a great way to update them. You can find a variety of hardware styles at your local home improvement store. With that said, it’s much more affordable to buy packs of hardware rather than individual pieces. If you want your bottom cabinets to really pop, install “feet” to the base. You can do this buy adding chair legs or bun feet, that you find in the molding section of the home improvement store. All you need to do is cut them to fit and paint or stain to match your cabinets. You can see how I added “feet” to my bathroom cabinet: HERE. Another quick and easy trick is to add corbels under your cabinets. This adds character and is so inexpensive to do. Just paint or stain to match your cabinets and attach. Last, but not least, under cabinet lighting not only updates your cabinets, but makes it so much easier to see what you’re doing. To cover the most area, use strips of LED lights. You can find kits in the lighting section of your home improvement store. You don’t have to live with ugly cabinets. These DIY updates are easy and affordable. What are you waiting for? 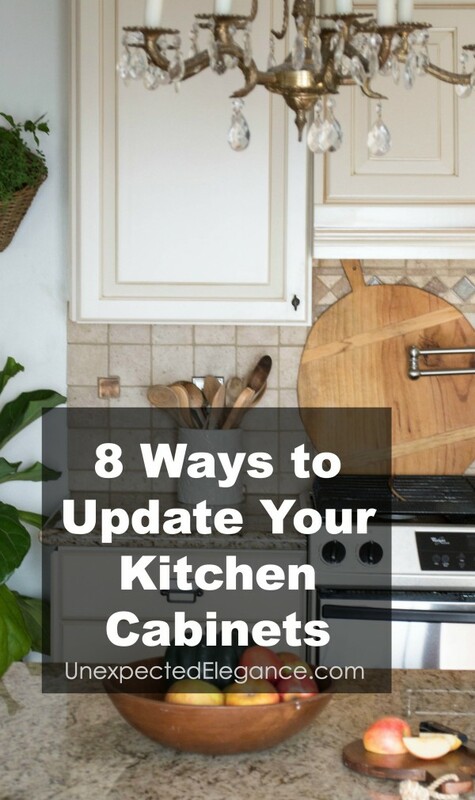 Start making plans to update those outdated cabinets this weekend. I thought your advice for using chalk paint on my cabinets was really interesting. Being able to clean the surface of my cabinet and only apply one coat would help me save a lot of time. That was one concern that I have about painting them since there’s a lot of other work that I need to do in my kitchen. I’m glad that you pointed out that I would still need to add a sealant over my paint and wax it from time to time to keep my cabinets looking great. It’s amazing what changing up the hardware can do for your kitchen cabinets. A little paint is always a great idea too! Thanks for sharing! Awesome post for kitchen cabinets. This is useful for all kitchen designers. Thanks for sharing wonderful information!! I love the kitchen in your pic above. Can you tell me what materials/wood type is used? is it Oak? I’m trying to figure out what kitchens are oak vs maple – but I can’t figure out how to tell? I’m a fan of the white/pearl look and want to get my kitchen to look like your pic, or if I can afford it this is my dream: http://custom-kitchen-cabinets.com/gallery/64/ .. i love love the farmer sink and the colors, but don’t know if it is oak or not? I’ve been told that oak is the way to go so the kids won’t destory it and wear and tear is much better. I really like the suggestion to increase the height of your kitchen cabinetry. My wife and I have been trying to find a way to revamp our kitchen and I think that this is going to be the way. I will definitely pass this article on to her! I find it a great idea to put LED lights underneath cabinets to update them and give more light to the kitchen. If I were to have this made in my own kitchen, I would ask a contractor take a look at my electrical system first. Doing this will not only assure that the system can handle the additional lights but also know that my home can be kept safe from any electrical emergencies.